This time I hesitate to introduce the most delicious eel cuisine in the world. It is because the price of eels is already very high. Increased popularity of eels in the world means I cannot eat it at present price. I want to hog dainty backstage, but it is my birthday today. So for my dear readers, please share the delicious delicacy. But, for your eyes only! Sushi is now one of the world-famous Japanese cuisine and more and more people get used to eating raw fish worldwide. For even Japanese people, however, it had not been customary to eat raw fish until soy sauce was invented. The miraculous seasoning, soy sauce, has developed typical Japanese cuisine such as sushi or sashimi (sliced raw fish). It has been well-known that eels which are high in protein and low in fat is good for our health. According to a folk tale, a son catches eels to have an ailing mother eat eels. I think the cooking method in the story was completely different from what I would like to introduce. Eels were highly regarded as its nutritional quality but the taste itself. Though, things were changed in the Edo Period (1603 – 1867). A new recipe for eels was thought out. It is to broil eel with special sauce by charcoal fire, which led eels to become explosive popular. Without the recipe, more eels would have not been eaten by human beings and could live their enter life peacefully. Sorry for eels, but it is fact that no delicious cuisine is available more than broiled eels – kabayaki. It is easy to crosscut a cucumber but a bit difficult to cut it lengthwise with a kitchen knife. Moreover, it is too difficult to clutch a live and slippery eel let alone clean it. Sushi chefs are professionals requiring much training. So do chefs specializing in broiled eel, kabayaki. It is often said that “To be a full-fledged eel or “unagi” chefs, it takes three years to skewer eels, eight years to cut into filets, and the rest of your life to broil them. So, please check up the recipe. First, put an eel on a chopping block and pit it with an awl. Cut the back from head to fishtail in one filet which is to be thinly extended in a rectangular shape. Second, thread the filets onto skewers. If it fails just right, broiled and softened filets will fall off skewers into charcoal fire. Skewering looks easy in the movie, but it is possible only for skillful chefs. I like cooking, but cannot clean and cut into eel filets. Surprisingly, Japanese technology invents the machines of the movie 2 specializing in skewering of eel filets. Are eel chefs no longer necessary? The answer is no. The most important step of kabayaki is broiling. Eel filets are required to be carefully broiled over charcoal fire. Once they are browned to a turn, they are dipped in a special sauce. And this steps are repeated time and again. The ingredients of the sauce are sake, soy sauce, sweet cooking rice wine and sugar. Each eel restaurant has their own recipe for the sauce which sometimes includes broth with eel head bone. I watched on a TV show in which a masterly chef broiled eel filets until nicely charred. This subtle craftsmanship determines the tenderness and the degree of sauce soaking. When a bad cooker tries the step, he cannot adjust the amount of fat and the taste and texture are least palatable. The broiled eel is placed on boiled rice and special sauce is poured. At this time the sansho powder is sprinkled over the food to get rid the eel of its smell. It is served together with pickles and a Japanese soup including eel liver. The arrangement varies from region to region, but kabayaki takes its origin from Edo or today’s Tokyo. So, at first, I introduce the Tokyo-style arrangement. The Image 5 is the Nagoya-style named “Hitsumabushi”. I recommend you ask any Japanese the taste. I already know the answer. This is the most delicious eel cuisine in the world! © Copyright Fisheries Research Agency All rights reserved. Eels are classified as farm raised and wild ones. The ratio is 97 to 3! Exquisite eels are said to the latter which travels down a river to the sea for spawning. I ate a wild eel one time and the texture and fatty portion were much better than cultured eels with a lot of fat. Farm raised eels are to raise wild young eels (alias glass eels of the Image 7) which are harvested in the sea or rivers and fed in eel farms (Image 8)　to rear until they are fully grown. The improvement of feed mixture can make the taste of farmed eels touch that of wild ones. Anyway, eating wild eels are recommendable if given the chance. However, once you get addicted to the taste, it will cost you too much money. Please be careful! Copyright © Geographico! All Rights Reserved. 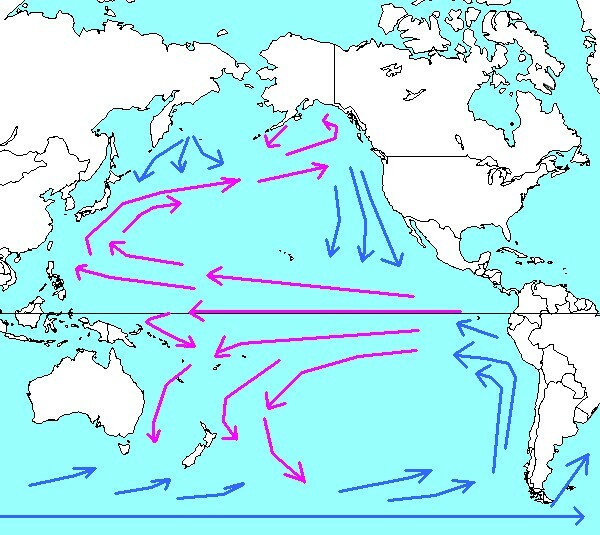 Ocean currents in the Pacific Ocean. Red arrows indicate warm currents. On the other hand, blue ones cold. Eel life history is still mysterious though eels and Japanese cuisine are closely related. Aristotle even thought that eels were born of mud. Where eels were born was not an important matter for kabayaki lovers. Recently, however, things has been completely changed. Overfishing, a change in ocean currents and riverbank protection works trigger sharp decrease in volume of glass eel catches, which leads eels (Anguilla japonica) to be endangered species. In reverse proportion to the catches, the price of glass eels has skyrocketed. A portion of unaju (Broiled eel served over rice in a lacquered box) used to be available at about \2,000 but now is sometimes at over \4,000. An existing method of eel farming has been to raise wild glass eels captured at the mouth of rivers. Unfortunately, it makes things worse because the number of wild eel just decreases, which means the depletion of eels themselves. On the other hand, complete aquaculture is to collect eel roe by hand and to raise them to adult eels. The technology makes it possible to have no bad effect on ecological system. We will be able to eat eels with no worry. Several decades have passed since the research of complete eel farm rising started. 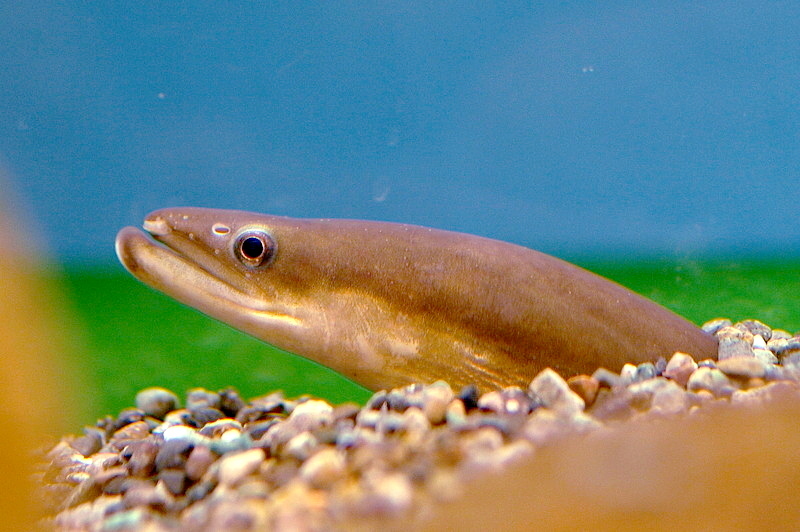 At last in 2010, it is successful to develop roe to adult eels in a laboratory. Today’s technology costs too much per eel. Some day in the future, when large-scale production is possible, inexpensive complete farming eels are available. Shane, oops, eels, come back! The Japanese means that it is said that the food with a word beginning with “u” prevents you from becoming illness. “An ox? Why? I am reading the article about eels!” You may well think so. And it is not my misspelling. Do you hear the word, “Oriental Zodiac”? Twelve animals represent each year, month and day in rotation. For example, 2016 AD is monkey year. On a day of the ox in midsummer it is the hottest in a year after the rainy season ends. An ox pronounces “ushi” in Japanese. It is said that the food with a word beginning with “u” prevents you from becoming illness like the Image 15. Eels attract attention in that way because the Japanese pronunciation of eels is “unagi”. Actually, nutrient-rich eels enhance your stamina. On a day of the ox in midsummer when people suffer from summer heat, eating kabayaki has become popular since the middle of the Edo period. On the day, TV news always cover scenes that eel chefs make great efforts to broil too much eel in front of charcoal fire. It is already very hot day. Kabayaki lovers, of course, and people who are usually not interested in eating it, get the urge to have the meal. Sushi or tempura is already popular with tourists to Japan. And eel cuisine, kabayaki, is strongly recommendable. Please mind you. This is just between you and me! Eat me, if you dare! With Seasonal Fishes, How about Enjoying Japanese Cuisine? Let’s talk about Japanese food!